9050-0001. Sterling Silver Souvenir Spoon St. Augustine Gates. 9050-0002. Sterling Silver Souvenir Spoon Library Congress DC. Hdle obv. embossed star at the finial + view of US Capitol buildings + portrait of G. Washington + embossed goldenrod stalk + US shield + eagle. Hdle rev. embossed view of the White House + Washington monument entwined with laurel branches. 9050-0003. Sterling Silver Souvenir Spoon Cattail Deadwood S.D. Hdle obv. embossed view of cattails & leaves. Hdle rev. embossed reverse view of cattails and leaves. Hdle obv. under picture of Founder on enamel (large) finial. (enamel damaged at feet of founder). Marks: M&B (= Marston & Bayliss)+ Anchor-Lion-A. (circa 1920s). As much as many people think that Sir Stamford Raffles is the founder of Singapore, there are still debates about who is the founder of Singapore. Some say it was William Farquhar who is the founder while some said it was John Crawfurd. Hdle obv. embossed view of SS(State Seal) at the finial + goldenrod stalk + “New York” on shank. 9050-0006. Sterling Silver Souvenir Spoon Apostle Rubens. Hdle obv. embossed FF Apostle at finial + twisted decorative shank. BL: embossed portrait of “P. Ruben.” (wearing his characteristic floppy broad brimmed hat and sporting his distinctive beard). 9050-0007. Sterling Souvenir Spoon Wayang. Javanese Shadow Puppet. Hdle obv. engraved and cut-out image of the puppet. Hdle rev. ditto image of the obverse. BL: scalloped bowl with bright cut designs. Wayang kulit performance of Indonesia is among the greatest story-telling traditions in the world and lies close to the heart of Javanese culture. 9050-0008. Silverplate Advertising Souvenir Spoon Foster Stevens & Co.
BL: embossed view of 4 story building with trolley and horse-drawn carriage + “Foster Stevens & Co.” (located inn Grand Rapids, Michigan). 9050-0009. 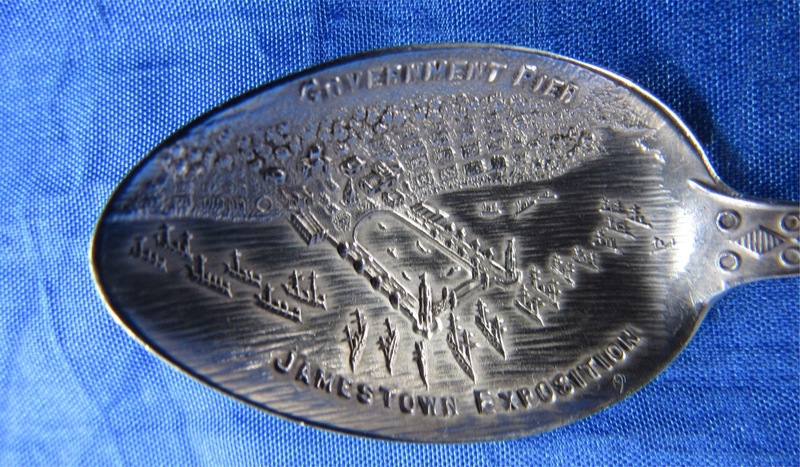 Sterling Silver Souvenir Spoon Jamestown Government Pier Indian. Hdle obv. embossed profile of Indian head + decorative shank. 9050-0010. 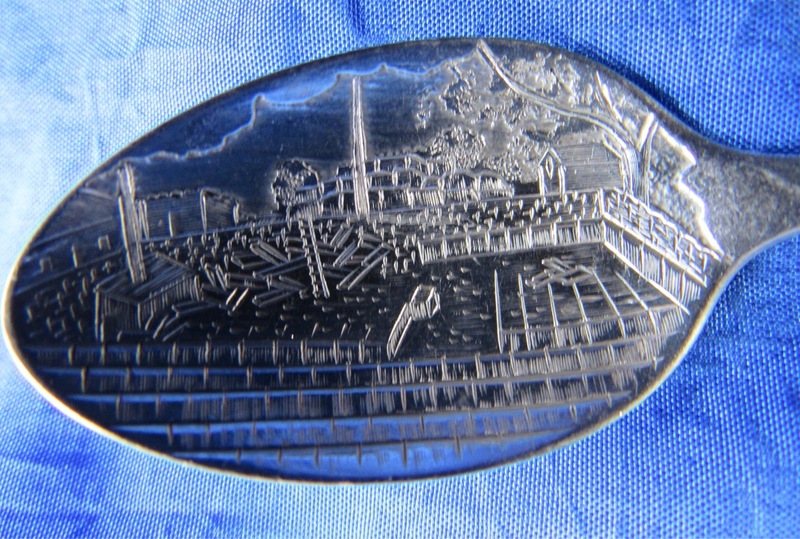 Sterling Silver Souvenir Spoon Newburgh NY Washington Headquarters. 9050-0011. Sterling Silver Souvenir Spoon Gouverneur NY. BL: engraved bright cut view of St Lawrence Marble Quarry at Gouverneur, NY. 9050-0012. Sterling Silver Souvenir Spoon Hand made. Hdle obv. cut-out view of flowers + twist shank. 9050-0013. Sterling Silver Souvenir Spoon Hand made flower. Hdle obv. cut-out view of flower and leaves at the finial + twist shank. BL: plain & lightly gilded. 9050-0014. Sterling Silver Souvenir Spoon Admiral Dewey & flag. Hdle obv. embossed US flag (red, white & blue enamel = damaged) + beaded shank. 9050-0015. Sterling Silver Souvenir Spoon Roman style spoon. MK: (anchor+lion+M) = Birmingham 1920 (circa) + SLp = Suckling Ltd.
Russian spoons Reprinted from 1986 Gzhel Catalog (Sovietski Collection) in which Silver Tea and Coffee Spoons from the Kremlin Vaults were being sold. "Decorate your table with these elegant hand-enamelled, gilded spoons, some of which were actually used in the Kremlin at official state dinners of the USSR. With the demise of the Soviet Union, Moscow is selling its legendary collection of silver tableware. We've purchased all these exquisite spoons, direct from the Russian governments' secret Kremlin vaults. Each spoon is 20 to 40 years old, stamped with the USSR's official hammer and sickle crest and crafted from .875 pure silver and plated in 18K gold with a hand-enamelled design on the handle. Tea spoons about 5 ½ " and 25 grams; coffee spoons about 4 1.2" and 16 grams….."
9050-0016. Russian, post revolution [i.e. Soviet] Cloisonné spoon. Entire spoon = 18K gold- washed. Hdle obv: decorative finial with blue cloisonné background with circles with red dots. MK: Moscow. stamped [maker marks (???] + ^+star+875 (i.e. 875/1000 parts pure silver)]. 9050-0017. Russian, post revolution [i.e. Soviet] Cloisonné spoon. Entire spoon = 18K gold- washed. Hdle obv: decorative finial with blue, yellow and red cloisonné background with flowers. 9050-0018. Russian, post Soviet revolution Cloisonné spoon. Entire spoon = 18K gold-washed. Hdle obv: decorative finial with green and blue leaves on gold background. MK: stamped [maker marks + star + 926]. 9050-0019. Russian, post Soviet revolution Cloisonné spoon. Entire spoon = 18K gilded. Hdle obv: decorative finial with dark blue background. MK: Moscow. stamped [maker marks + star + 966]. 9050-0022. Silverplate Flower Set. Six (6) spoons = sold as a set: name on handles (left to right): hyacint, margriet, tulp, narcis, viooltje, anjer. Handle Obverse: enameled handles in dark red, yellow, pink, white blue and green; spoon handles have transparent enamel with leaf pattern visible underneath. Enamel = mint condition; not cracks or chips. All spoons = gold washed. Maker: marked V. B. Sterling =Volmer Bahner (renowned Danish silversmith, famous for his jewelry creations). Note 4 of these spoons are marked "V. B. Sterling." Two (white enamel and yellow enamel) = have no marks.